In 1924 the Olympics were a very different kettle of fish compared to what they are today. Before big-time corporate sponsorship, before one could make a career out of sport, before widespread doping had even been conceived of, the spirit of amateurism ruled the games and the unadulterated message of the Olympic spirit was the overriding theme. Interestingly, it was the first time the Olympic motto “Citius, Altius, Fortius” was used. This is the story of two athletes’ journey to those Olympic games, Harold Abrahams and Eric Liddel. One is a Jew who believes that the whole world is against him and the other deals with conflict between his faith and his love of running. The film begins with a sobering scene from the funeral of Harold, with the eulogy being read out by his Cambridge friend, Andrew Lindsay. It then cuts to a scene from the past, at a training camp of some sort, with the members of the British track team running along the beach. Then the immortal Chariots of Fire theme is heard, this is where the story really begins. Occasionally narrative is used to advance the plot, and to provide information on the characters, but it is not obtrusive, nor does it drag on. It also accomplishes the task without doing what so many films do, and that is give away too much information. The telling of the story carries on throughout the film without the viewer really noticing, at all times feeling like he or she is part of the action. Ben Cross and Ian Charleston, who play the main protagonists, do a superb job. Ian Charleston especially for his accurate depiction of Eric Liddel’s somewhat unrefined running style. The real stand-out performance, however, is Ian Holm’s as Sam Mussabini who coaches Harold. The writing of the characters is, on the whole very good. A quick browse through the messageboards of some internet movie sites reveals that this film wasn’t as well appreciated by the american public as it was by the american film academy (who gave it best picture in 1981). On of the strongest criticisms was that it was unrealistic (strange, as it is based on a true story) and that the dialogue was not believable. This probably stems from both the inability of most americans to understand cultures outside their own and the rather peculiar culture that surrounds institutions like Cambridge. The soundtrack is treat. Although it can occasionally seem a little dry, it really is quite brilliant and very much a loner in the film soundtrack world. Vangelis (who’s real full name is Evangelos Odysseus Papathanassiou) who is also known for the soundtrack to Bladerunner, puts together a beautiful mix of rhythm and melody using only a mixing table, a sampler and a synthesizer. 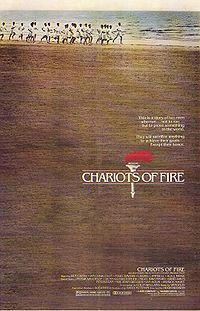 In the main theme of Chariots of Fire, he has created possibly the most recognisable piece of music of the modern era, indeed, many people have heard the music but have never seen this film. The synergy between soundtrack and film is flawless and that is ultimately what makes this film great. The music is the icing on the cake and it truly binds the viewer to the world of the film and immerses the viewer in the world of the 1924 Olympic games. Flaws in this film are few and far between. The story tugs at the heartstrings and is uplifting, inspirational and insightful. The music, cinematography, script, story and acting work together so well, that one wonders what it might take to create a better film. Most impressive, is this film’s ability to do all this so seamlessley that the viewer is scarcely aware of all these qualities. One only really notices when one watches another film, and notices the absence of these elements, or the lack of synergy between them. Easily one of the best films I have ever seen. Beautiful, a classic, five stars.